It is a daily walk that breaks my heart still to this day. I hope that I can encourage you by saying time is key. The first two years are a blur. I went from fighting to keep his name on the tip of my tongue to pushing his memory deep in the back of my mind to help with the sleepless nights. I would love to help in any way that I can, even if it is just someone who will listen when no one else understands. I would love to hear more about your son and the circumstances you went through. Talking about it is very good in spite of what others might think. I'm here for you Patti. One day at a time. I attached a photo of our son taken the night before he died. 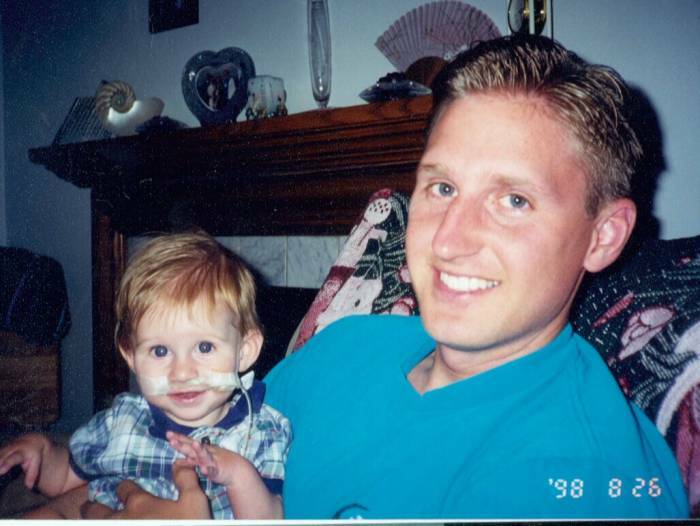 Jonathan died following his 3rd open heart surgery to correct a very serious heart defect. He was a fighter!!! All the emotions you are having are ok. Of course you miss your son and what loving mom would not want to join her child. But, from the day Dustin was born God had a plan for him, a plan that does not make sense to us. My mom died suddenly at 72, some would say but she lived 72 yrs here on earth. But, she was doing so many things for the Lord, she went to the womens prison every Tues night to facilitate a bible study, participated in retreats for wayward teens, she and my dad were the " older couple" of their church and brought so much to that church family, the Pastor became depressed when my mom died. Her funeral was unbelievable, you would have thought they were honoring Mother Thereasa, some of the x prisoners talked to the crowd and shared how much hope she gave them. She was not always that faithful servant may be for about 15 yrs. But, why would God take her when she was helping so many? One day we will know. I hardly compare the loss of my 72 yr. old mom to your young son, I think you know that. My middle child, my only son Matt/33yrs. old just got married 18 months ago, but I tell you what I would awaken at night and pray for his safety, he lived hundreds of miles away, worked in bars and restaurants until the wee hours of the morning, I was terrified one night the phone would ring. I can not even pretend to know what you are going through but slowly your emotions will stabilize, I promise, most of all God promises. I just happened to look at your web site, my mouth is wide open, I am so sorry about your son. May you feel the hug and love I am sending you. I read many the letters, poems, viewed the pictures...all very touching. I can’t say how sorry I am for your loss. I haven’t checked my email in a few weeks, logged on this morning and saw yours. I am so so sorry. Your son was obviously an amazing man. I wish I could’ve known him, but I feel like I do from your loving words about him, your family and your amazing relationship. You all are so uplifting to everyone you come across. I found this poem when my father passed and I felt it spoke well towards our feelings at the time. I hope it offers you some comfort too. Know that my prayers are with you all. Lola’s too. Words can not express my gratitude for you sending me this email. I am amazed that in your time of grieving you would be gracious enough to send this email. I found out a few days ago what had happen to Dustin and my heart has been heavily graved in his loss, even though I know he is in a better place (The Heavenly Father's warm embrace). Dustin had a special place in my heart, he was honestly one of my favorite people in the whole wide world. I remember on numerous occasion Dustin and me discuss the deep things of God. I loved/love Dustin's heart and his ability to be authentic at all time. He was/is a lover of people. Dustin was/is the kind of person that impacted the lives he came in contact with. I believe that many will come to the saving knowledge of Jesus Christ not because of Dustin's death but because of his life. Know that I am deeply praying for you and the family. Over the last few days as I have been reflecting and morning over Dustin death, the Lord reminded me of the poem/song I read at my grandmother's funeral a few years back that I would like to share with you. I am soooo glad she could come and be with you. I know it must mean allot to you to have her there. You know I lost mom in Mar and I still feel the loss adn the absence of her in my house, but also know she is with God and my dad where she has wanted to be for so long. That gives me allot of comfort in its strange way. I too can not imagine what you are going thru either, I pray I never live to see one of my kids pass before I do. Doug is 30 now and I worry about him more than anyone the way he drinks and thank God every time he gets behind the wheel that he has not hurt or killed someone or even himself. We don't realize how precious life is until we loose someone that close. I know you will get thru this and only in time will the pain start to getting duller but will never go away. We only find a way to deal with it better over time. Know that I love you and am with you in spirit since I could not be there in body. I would just like to convey my sympathy for your beloved son Dustin. Although I have not purchased a puppy from you, I visit your website from time to time and was shocked and saddened by the news. May God bless you and your family during this difficult time. You are so strong!! Your faith and love in your son has saved you. Please know we continue to pray for you and your family and admire your inner strength. I am so glad that you and your puppies are part of our life. I worked with Dustin on the Vantage just a few weeks ago. I only worked with him for 2 weeks, but everytime I saw him in the hallway he always had a big smile and a friendly hello. he always seemed to be a genuine friendly guy. We would often see each other in the gym after shift and he would always get me pumped up with his loud music and his enthusiasm on the machines. that guy could run for hours! I lost a brother 2 years ago and my parents lost a son, so I understand how hard it is. I am so sorry for your loss and wish you all the strength and courage that I know it will take to get through it. My parents often say that time doesn't lessen the pain but you learn to deal with it better everyday. And he is there with you helping you through it. Again....I am so sorry to hear about Dustin and the pain that your family is going through. All my love and prayers to you and your family. I am glad for your sake the day is over, and hopefully the healing process can begin. I was amazed at how strong you were on the outside, even though I know your heart is broken on the inside. Continue to be strong and know that he is in a truly greater place than we are, and in the grand scheme of things the time is short till you will see him again. The ceremony was beautiful and such a wonderful tribute to his life. With all of the stories, pictures, family and friends I felt like I knew him, he really seemed like a great person and I wish I had a great friend like him. He has apparently blessed so many lives and he blessed mine today, he reminded me not to take life for granted, and to really enjoy life more. I hope I was able to bring you some comfort today and I will be here in the future. I love you dearly and will always be here when you need a sholder to lean on. This is for Patty and David to know how much of a hero Dustin really is to me and Jr.
Not knowing that Jr has a medical condition that is life threatening Dustin had no idea what was ahead of him. A while back Dustin and Jr went out on the town together and must have had a really good time (smile). Jr stayed the night at Dustin's afterwards. In the morning Dustin went to wake Jr and could not. Jr was stiff and unresponsive. Dustin picked Jr up in his arms and carried him to the truck. As Dustin was driving a stick shift truck he managed to get Jr's cell phone, look up my home number and call it. When I answered the phone I hear someone yelling "Jr wake up please, Jr wake up". I screamed into the phone "what is wrong?" Dustin answers me with a voice like none I will ever forget. The fear in his voice was horrifying. He said, "Susan, it's Dustin. Does Jr have seizures?" I said "no" and before I could say anything else Dustin said "he's stiff and not moving, I can't wake him up". I said "Dustin call 911 right now, you have to get Jr to an emergency room right now". Dustin said, "I am in the truck taking him to the hospital". I told him "pull over and call 911 NOW". Dustin said "I'm right here by the hospital". I told him "okay, pull up to the emergency room doors and call me as soon as you get him there". A few minutes later Dustin calls me and says "we are here at the ER, they are taking him out of the truck." I said "Dustin listen to me, you need to tell them this." He said "okay." As I was telling him what was wrong with Jr he was repeating it back to the nurse and saying "oh my god." I told Dustin I was on my way. When I arrived at the hospital Dustin was sitting beside Jr's bed watching the doctor and nurses working on him fear in his eyes and tears rolling down his cheeks. I asked Dustin what happened and he said "they went out that night and he couldn't wake him up and he didn't know what to do". I asked him if he knew what Jr had and he said "no". For some reason and to this day I don't know why I got angry. I don't know if I thought it was Dustins fault but deep down I knew it wasn't. I asked Dustin to step out of the room and he found a chair right outside Jr's ER door. I went out, sat by Dustin and we talked. I explained to him what Jr had and that it was not his fault. I told him thank you for getting him to the emergency room so fast because every second counts when Jr gets like that. I told him that this had happened once before but everything would be okay. He never took his eye's off Jr and the tears never stopped. I hugged Dustin and told him it was okay. We then went back into the room and Jr's vital signs were coming back up. This was a very serious situation and Dustin handled it without second thought. I have to smile though when I think about him driving a stick shift truck, yelling at Jr, having the sense to look on Jr's cell phone for my number, and calling me. Now, who do you know that can multi task like that, My hero Dustin. Because of Dustin I still have my son. Dustin is my Hero! I am so sorry that you have to go through this pain. Yet so young Dustin has done his work here on earth and God has bigger and better plans for him now. He will always be there with you and watching over you. I know he will be Jr's Guardian Angel as he will be yours. Sometimes in these situations its hard to know the right thing to say. I went to John Wells funeral a few days ago. The preacher, he talked about what we the ones left behind go through after life here on earth. He said as we transend into the next stage of life we all go through, those left behind are saying no don't go don't go, the other side is in joy saying in a loving and caring exitement, here he comes here he comes with open arms .... I believe he has greater plans for, and need of Dustin at this time. I met dustin in the 3rd grade when I moved to katy and he made an impact on my life then little did I know how long that influence would continue. By the end of 3rd grade we were best friends my fondest memory of being a child is when he would come over on the weekends we would watch the movie alive while we were watching it we would turn my a/c down as far as it would go then we would grab a sheet he would get on one side and me on the other and hold the sheet over the vent while we were under it and we would see if we could survive the cold like in the movie..the last time I saw dustin was june 1 2006 we were planning on meeting up sometime while he was home this time. But the first thing we talked about was being a kid playing alive and of course he had that huge trademark smile of his on. I just want you to know that you have been on my heart most of the time the last few days. I am so, so sorry for your loss. The website you created for Dustin's memory is so precious and it was such a privilege to get to view it. All I can do is imagine what you are feeling but I do know one thing, God loves you so very much. I'm overwhelmed by the sense of His feelings toward you. My prayer is that His peace envelops you even when it doesn't make sense. We have been out of town, which is why I haven't called you. I am going to call you tomorrow. Even if it is just to leave a message, I just want you to know that our hearts and prayers are with you. I have a friend that has a son that went to school with Dustin. His name Is Jaugue Ardoin. He went to elementary and junior high. He said to give you his prayers and that Dustin was a great person and he will be missed. This is Danyell, I am Robin's daughter. I just want to tell you I am so sorry to hear about Dustin, myself and all his friends are just completely heart broken. Dustin was amazing and was the funniest person I knew. I put up your link on myspace through a bulletin for all his friends to see. If I can do anything please let me know. First and foremost, my thoughts and prayers have been with you and your family since I heard about Dustin's passing. He was such an incredible young man that could always put a smile on any one, including a total stranger. I've had the pleasure of knowing Dustin since high school bible studies at First Baptist Church. Dustin will be greatly missed and moments cherished every day for the rest of eternity. You and your family remain in my family's thoughts and daily prayers. hello, my name is cody elliott and i went to school with dustin all my life and would like to help you out in any way that i can. i dont have alot of money to give but i do have alot of heart. please let me know how i can help you and your family out in anyway possible. i am a stay at home mom and i have all time in the world to help you. very sorry for your loss and he is safe with god now.